Dead Peasant Insurance is sometimes used as a shorthand reference for life insurance policies that insure a company's rank-and-file employees and name the company as the beneficiary. This means that the company receives the life insurance benefits when the covered employees die. This insurance may also be called "janitor insurance," "corporate-owned life insurance," or "COLI." How did it get the name "Dead Peasant" insurance? Winn Dixie Stores bought life insurance policies on approximately 36,000 of its employees, without their knowledge or consent, and named itself as the policies? beneficiary. The insurance brokerage firm that placed the policies prepared two memos describing the deceased employees as "Dead Peasants." These memos were part of the court?s record in a lawsuit in which the United States Court of Appeals for the Eleventh Circuit held that Winn-Dixie's policies were a sham transaction for federal income tax purposes. The memos were later used by reporters such as Ellen Schultz and Theo Francis of the Wall Street Journal and L.M. Sixel of the Houston Chronicle and incorporated into articles about this type of insurance. How does a person know if he or she is covered by a policy? It is often difficult for a person to learn whether he or she was covered by a "Dead Peasant" policy. These insurance programs became popular during the mid-1980s and have been an available investment opportunity for large companies since that time. Prior to 2006, however, there was no federal law that required employers to disclose the policies to insured employees. Any disclosure requirements that existed before 2006 were only through state laws, which were ignored in many instances. So, the only way a person could learn about the policies was through the employer's voluntarily disclosure. If this wasn't bad enough, Wal-Mart has been embroiled in litigation against insurance companies because they lost money trying to profit from the deaths of their "associates:"
"Discount retailing giant Wal-Mart cannot sue its insurers just because it gambled and lost $1.3 billion on getting a tax break from thousands of insurance policies it took out on employees, according to a brief filed by the insurers in the Delaware Supreme Court. "Press reports have dubbed the 'corporate-owned life insurance' policies at issue in this litigation 'dead peasant insurance' because most of the policies were purchased by companies that employ large numbers of workers at the lower end of the wage scale and most of the policy benefits went to the companies rather than to families of deceased employees. "Wal-Mart is contending in an appeal that it was entitled to rely on its expert insurance brokers to warn the company of the inherent dangers of buying COLI policies. Wal-Mart has asked the high court to revive its bad-faith and breach-of-duty claims against its insurers, which the Delaware Chancery Court had dismissed." "Wal-Mart is one of those companies under fire from the US Internal Revenue Service and labor organizations for the practice. The IRS considers COLI a tax dodge, and has pursued Dow Chemical, Camelot Music, Winn-Dixie and American Electric Power, among others, to recover tax underpayments. "The practice of using COLI is still widespread ... According to one source, Hartford Life Insurance estimated that one-quarter of all Fortune 500 companies have COLI policies, which cover the lives of about 5 million employees. Wal-Mart alone has policies on 350,000 employees." Find out more information and which employers take out "Dead Peasant Insurance"
This article isn't true in any way. You can not take out a life insurance policy on a person without their knowledge and consent, as well as needing a full physical and access to medical documents. Because corporations are always squeaky clean, right? The article is entirely true. Companies in all industries take out dead peasant life insurance policies with themselves as the beneficiaries. Bank of America, Boston Financial Data Services, and State Street Bank and Trust are but a few in the financial services industry. While we would never put somebody up to posting the first comment here, we of course can confirm that they are correct. How's your Mother's middle name spelled? Things aren't always what they seem.. The last line of "Absence of Malice" comes to mind. The story is accurate, but it isn't true. The most important thing about Janitor COLI is that it was usually "experience rated," which is juat a technical way of saying that the insurance company and the employer had a deal whereby the premiums paid were pretty much equal to the claims paid. So the company made no money on employees' deaths. None. Zippo. So, yes, they insured them, sometimes without permission or knowlege, but they made no money on their deaths, so it's kinda hard to find something to be upset about. No, the game was a tax arbitrage that worked only while the insured lived. As a result, the employer's interest was served by the employees' living longer, not by their dying. Not as convenient a truth as Michael Moore's version, but it is what it is, right? As for the term "Dead Peasants," it did not refer to dead employees. It referred to former employees, and was an allusion to Gogol's "Dead Souls," in which a guy in feudal Russia bought the title to dead peasants because, thanks to slow census revisions, he could obtain loans against their future outputs even though they were dead. In janitor COLI, an employer could obtain loans to pay for policies on former employess, who were then analogized to the "dead peasants" in Gogol's story. so let me see if i understand... these major corporations buy life insurance policies on their employees... if or when the employee passes, the money that the corporation gets goes back to the insurance company to pay for future premiums, right? "So let me see if I understand..."
Well, you don't. All of the profit in this game derived from tax loopholes. The tax loopholes persisted while the employees lived. The premiums were adjusted periodically so that neither the insurance company nor the employer made any money on the insurance. For a company to make money overall on employees' deaths, an insurance company would have to LOSE money overall on them. On what planet does the house lose that bet? No, as much fun as it would be to think the companies were exploiting the little folk, it was all about taxes, and when the government shut that loophole in 1997, it all went away. Walmart should serve as an example to All Americans of what is so terribly wrong with Corporate control of our legislators, and why after over 25 years of the destructive charade that is Voodoo trickle down economics we have more people living in poverty in America than any other industrialized nation in the world . How many more billions do the Walton clan need to make before they pay a living wage and offer health care benefits to those who work for them? Are these the Christian values I hear so much about, Exploit the vulnerable and profit from their suffering? Just six members of Walmart's Walton clan are worth as much as the bottom 30 percent of all Americans. The Republican Economic model for America will continue to force more and more of our citizens into poverty while the select few will continue their extraction of wealth from your pockets to theirs. 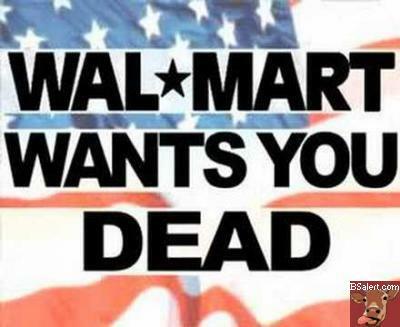 The cheap goods purchased at your local Walmart come with a terrible and expensive cost to our society. Register and Vote make your voices herd. My husband worked for wal Mart distribution center at the time of his death. How do I find out if they had a policy for him at that time? He passed in 2003.